Franklin Roosevelt the 32nd president of the United States is who I learned about in History today. He was a democrat just like Obama our newly elected president. He helped the United States to snap out of the depression in the 1930's. He helped to pass laws for workers. These laws limited working hours and paid fair wages. He also helped farmers. Laws were passed to raise prices for crops and farmers were able to get loans to improve their farms. 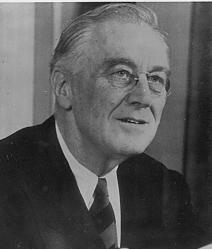 Franklin Roosevelt was the president who signed the Declaration to go to war for World War II. Unfortunately, he died before Germany surrendered. He was the only president to be elected 4 times and he was president from 1933 to 1945. It was interesting to learn about Franklin Delano Roosevelt (FDR) in history today.